Immediately this cool postcard reminded us of Leonard Cohen's Bird on a Wire. Haven't we all tried to be free like these guys! The literal translation for Rauchschwalben is barn swallows or smoking swallows. We prefer the second translation. But, it doesn't matter at all. The fellow in the middle surely doesn't care what the others are thinking - so, we're guessing him to be free! 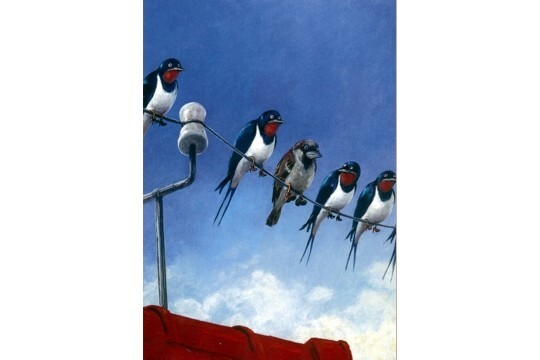 This image was created by German artist Rudi Hurzlmeier, famed for his pictures of birds in boots and shoes.